The largest known cave in the world by volume is Son Doong Cave in Vietnam. This cave is one of the great natural wonders of the world. Son Doong Cave is located in Phong Nha-Ke Bang National Park – UNESCO World Heritage monument. This national park is protecting the unique nature of Phong Nha/Ke Bang Karst plateau – one of world’s largest limestone karst areas, formed in Carboniferous/Permian limestone. 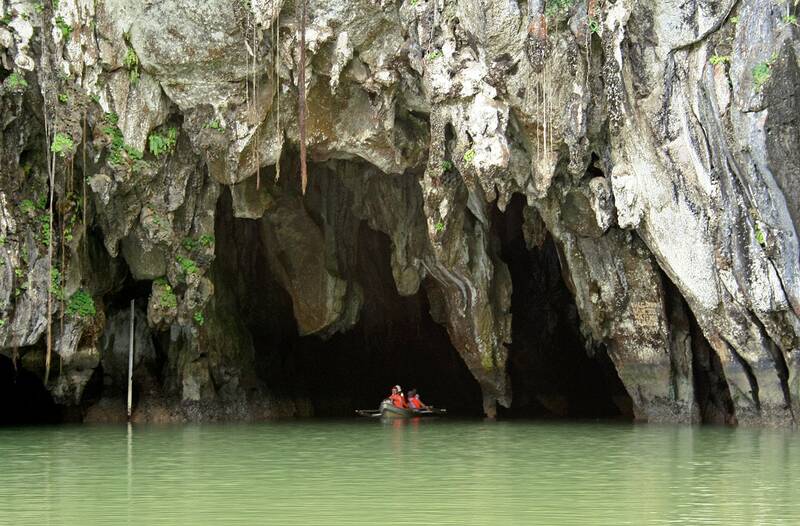 Limestone shields here are crisscrossed by giant caves, such as the Phong Nha cave (known length 44.5 km) with world’s longest known cave river and the gorgeous Paradise cave (31.4 km). Total length of known cave passages here exceeds 100 km. This karst plateau continues into neighboring Laos, Khammouane Region, where also are found giant caves, such as the amazing Khoun Xe Cave. Son Doong Cave has formed in fault zone, where a river was captured, e.g. its stream went underground. Analysis of sediments show that cave formed at least 2 million years ago but it is possible that it is much older. The giant cave has lasted for millions of years thanks to the high strength of rocks. Local man Hồ-Khanh as a teenager discovered the entrance in Son Doong Cave in 1991. It is not that easy to find this cave in the rugged terrain of Ke Bang jungle – contrary to several other cave entrances in this region, Son Doong Cave starts as a comparatively small hole. Through this hole could be heard the whistling sound of wind and roar of fiery stream inside the cave. Hồ-Khanh did not enter the cave – it was too steep and the prospects to fall into roaring darkness was not too attractive to him. He returned here much later, in 2009, together with an expedition of British Caving Association. This group was led by Howard and Deb Limbert who were surveying the area with the assistance of Hồ-Khanh and finding many new caves. 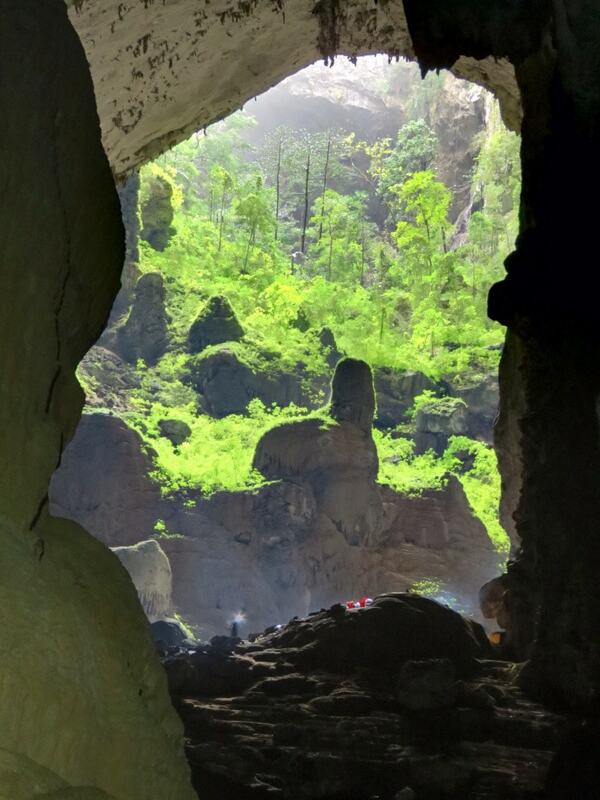 Exploration of Son Doong Cave was risky – the group had to traverse the powerful cave river several times but they were rewarded by the discovery of one of the world’s most amazing natural landmarks. The most amazing feature of Son Doong Cave is an enormous, giant passage in the central part. This passage is more than 5 km long, up to 200 m high and 150 m wide. In most places, it is at least 80 m wide and 80 m high and there is a long section where it is wider and taller than 140 m. Cave has its own climate, often there are clouds inside. Thanks to this passage Son Doong is the world’s largest cave, surpassing Deer Cave in Malaysia. 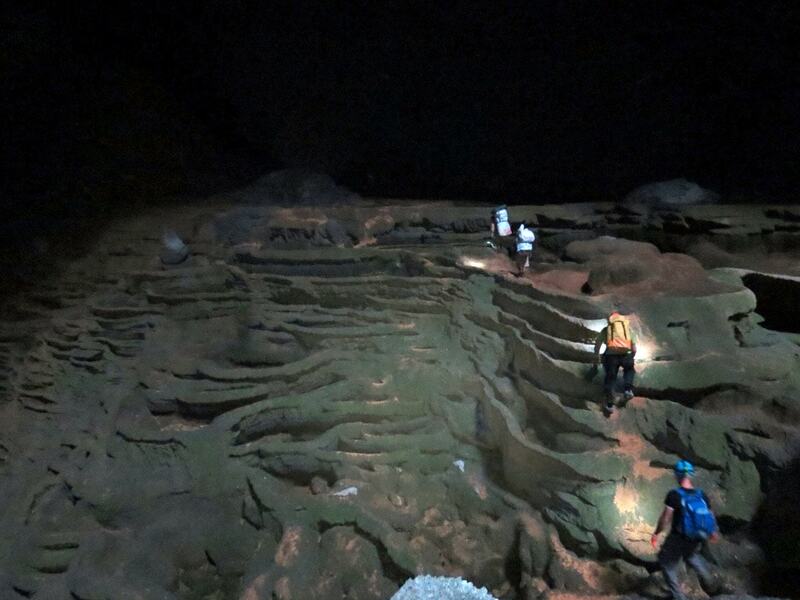 Measurements of Son Doong Cave have been made with laser measuring devices. At the far end of this passage is located the spectacular Great Wall of Vietnam – steep, muddy and slippery vertical wall which hindered further passage in 2009. It was traversed in 2010 when researchers reached the end of the cave. Nevertheless, there remain uncharted side passages. Son Doong Cave has two major opening in the ceiling – sinkholes. One is called Watch Out for Dinosaurs, as it reminds another world from long times ago. Here in the cave falls very tall waterfall. The other sinkhole, which is covered with lush jungle, is called Garden of Edam (ironic reference to the beautiful Garden of Eden in Sarawak, Malaysia). By the way – researchers have to be careful as the cave is infested by poisonous centipedes. 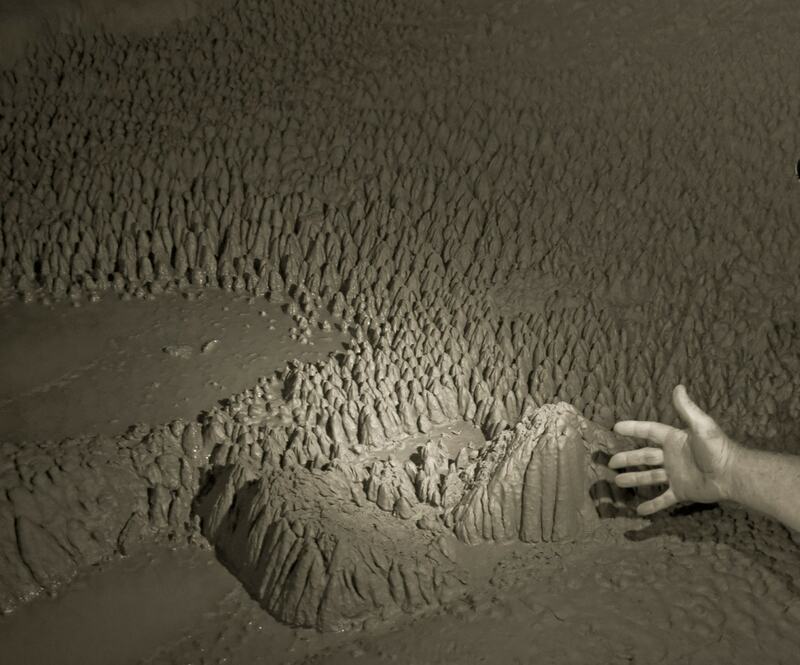 Researchers have noticed that monkeys enter through these sinkholes to devour snails in the cave. 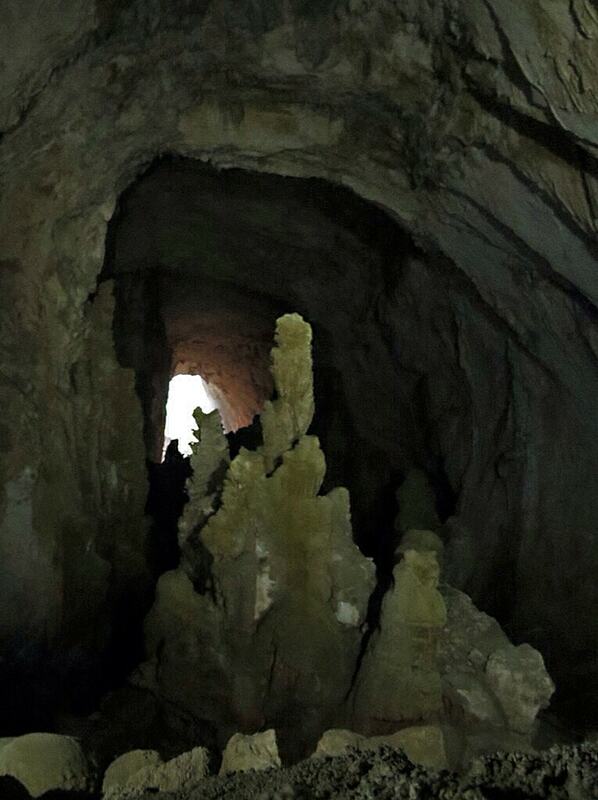 Stalagmites in this cave may be the tallest in the world, exceeding the 70 m height. One such giant is called Hand of Dog as it resembles paw of this animal. Behind the Great Wall of Vietnam researchers found also giant gours – rimstone pools. These gours now are dry and covered with green moss. Here they found also some of the largest cave pearls in the world – as large as grapefruits. These pearls are created by dripping water and their giant size could be explained by the big distance of falling from the tall ceiling. Is there place for tourists? Visiting Son Doong Cave is overwhelming to feelings. When one enters the giant cave room in places further away from the underground river, the eerie silence and invisible walls and ceiling (common headlights do not reach that far) create a unique experience. Not less impressive are the sinkholes with misty jungle, the cave waterfalls, stalagmites, pearls… Sounds like a perfect place to develop tourism. At the same time cave environment is very fragile. Son Doong Cave is unique and it would be a huge loss if this fragile beauty would be lost forever. 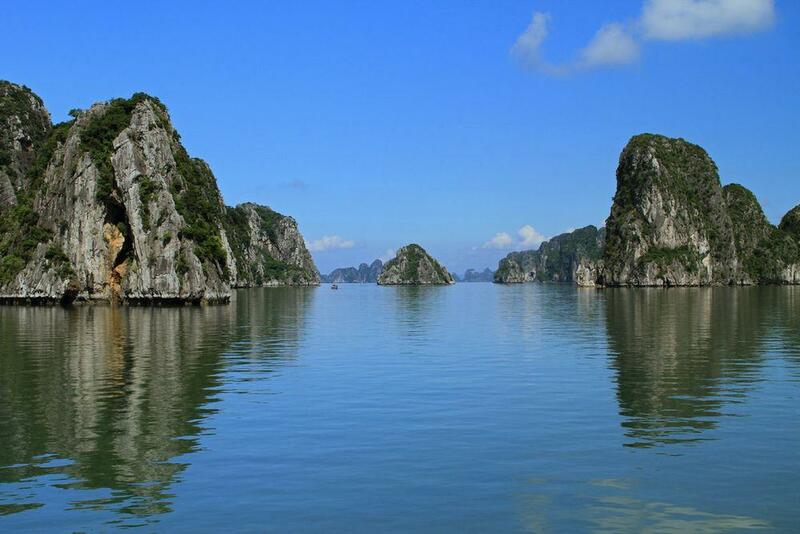 Authorities in Vietnam seem to be indecisive about the development of tourism here. Meanwhile, some businesses are active. In 2013 the first group of tourists arrived in the cave. These were not the usual tourists – trip required to abseil 80 m into the sinkhole and costs from each participant were 3,000 USD. Such high-end adventure tourism could bring many benefits for the local community… but who knows how this will affect the cave environment. Son Doong Cave. Accessed on June 15, 2014. James Owen. 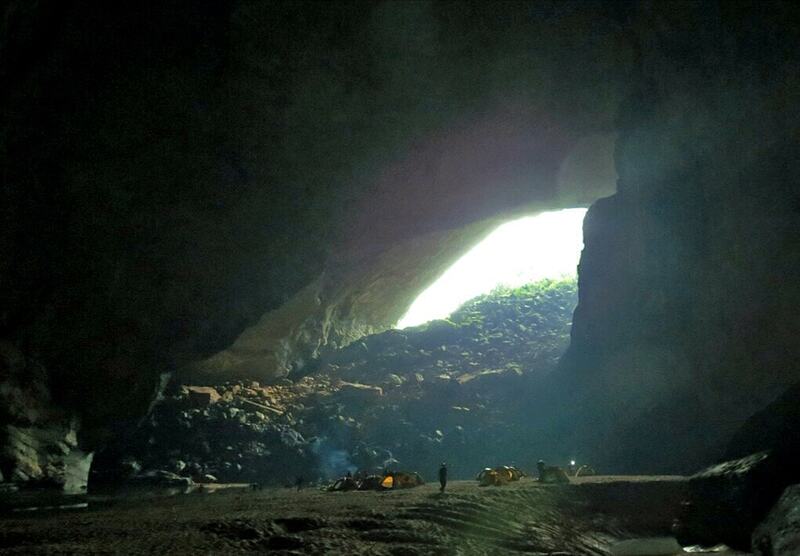 World’s Biggest Cave Found in Vietnam. National Geographic, July 2009. Accessed on June 15, 2014. Mark Jenkins. Conquering an Infinite Cave. National Geographic, January 2011. Accessed on June 15, 2014. Vietnam is surprisingly diverse. Here are found giant contemporary cities, traces of ancient cultures and pristine, little explored nature. Though, those which we know offer a surprising diversity of unusual features and impressive sights. Chris Fitch takes you on a journey through the world’s most wild places, visiting immensely diverse floral kingdoms, remote jungles abundant with exotic birds, and both freezing cold and scorching hot inhospitable environments. From these natural havens we travel to the extreme and the incredible: lightning inducing lakes, acidic mud baths, and man-eating tiger kingdoms. Caves are found on every continent. The United States is home to the world’s longest cave system, the Mammoth Cave in Kentucky, and to the world’s most popular tourist cave, New Mexico’s Carlsbad Caverns. Great Caves of the World takes readers to these and 25 other astonishing and challenging caves across the globe.